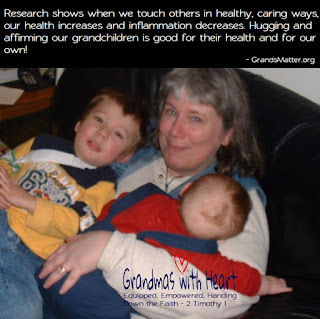 grandma's cookie jar: Hugs are Good for You! Hugs are good for our grandchildren and for us, so if you live near your grandchildren, make time to visit and hand out some of those good-for-you hugs! If you do not live near them, consider the following ideas . . . give a "virtual hug" by making a call with facetime. Tell your grandchildren to wrap their arms around themselves and then, "send" the hug! Or, make a "paper hug" by taping paper end to end, extend your arms and lay down with your arms on the paper, have someone trace around your arms, decorate and write messages then cut out the arms - connect across where your body is to make a big "hug". Mail it to your grandchildren. If you use a colorful lipstick and "kiss" the "hug", you will be able to send them "hugs & kisses"!